Do you want to get rid of paper forms and you do not know which platform is better? Nowadays, the most common ones are Google Forms, Access and MoreApp. In this blog you can find a comparison in order to find out which one fits your company. When changing paper forms to digital ones, several questions may arise about the characteristics of the different options available in the market. 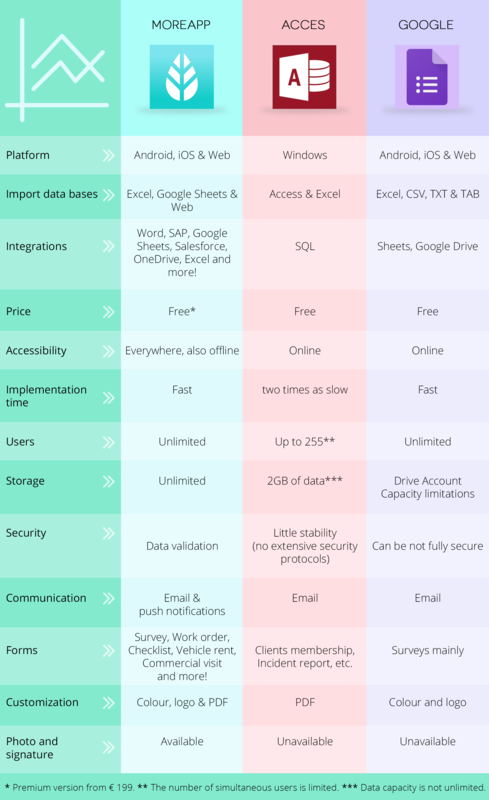 That is why we bring you a simple comparison with the most relevant information of the main digital forms platforms. First of all, it can be interesting to know the compatibility of these platforms with the main systems (Android, iOS, Windows & Web) and the possibility of integrations with other systems like SAP, Exact and Excel, in order to know whether one of the options fits in your case or not. Moreover, you will be informed about other aspects such as the price, accessibility and data and users limitations at each one of the platforms. Last but not least, you will also find out which type of forms are offered so that you can judge by yourself and you can start enjoying the option that suits your company the best! To sum up, if there is enough IT knowledge and you are looking for a platform in order to fill in simple forms with your Windows computer or tablet connected to an Access data source, and design is not a priority, the best option are Access forms. In contrast, if you prefer to do online surveys with exportation of data to Google Sheets without the possibility of designing the final PDF attached, you can choose Google Forms. Finally, if your company needs work orders, checklists, surveys or other forms, and you need to work with offline forms, the best will be a digtial forms platform like MoreApp. Don't wait and create a free account now!